Resilience efforts de jour, 3/30/15. Sometimes you have to do it exhausted. After working 10 hours at work on a Monday – the start of a week where corporate politics has crapped all over everyone’s good mood and job security – I came home, cooked dinner, and kicked up my feet to watch a documentary (Farmageddon) with my first born before heading off to an early bedtime. I knew she only had about 30 minutes of watching before she had to take off to go exercise with some friends, but that was cool because I figured she wouldn’t be that into it anyway. She was digging it and as she was leaving she said she was going to finish watching it this week. I settled in to watch the rest before going to bed, but after about 10 more minutes I was so disgusted with the way of things in this society, and the drive to free myself from my shackles was so great, that I got up and went outside to dig and plant even though it was getting dark. I planted another tomato plant and some snap peas. It wasn’t much but it was something. If I’m not going to do it tired, then it might not get done at all. I am so over being dependent on the way things are. It’s exit strategy time. Man it’s been a long time since my last post. As the song says: time keeps on slippin slippin slippin, into the future. I’ve really had no choice though. I have had to reduce my expectations and re-evaluate the reality of what I am able to accomplish with the time I have vs. the necessary obligations I have. It’s not just me though, it’s our entire working class / disappearing middle class caught in the avalanche of downward class migration. Point in case, here is the sign of the times: I’m getting emails coming in begging parents to volunteer their time for various yearly events for the kids. These aren’t events that are new, but that take place every single year around the same time. For instance just this week (and it’s only Wednesday) there are requests for field day at the elementary school, a youth event at church (which surprised me as I thought there are many stay at home moms and many of the kids are home schooled), the high school after prom party which – according to the email – needs 100 parents to open the doors and 27 have volunteered so far. These events take place every year at the same time every year. Why is it that in years past the pleas weren’t as desperate? The answer can be summed up with a single declaration: more bricks less straw! This is the sign of the times. “But the king of Egypt said, “Moses and Aaron, why are you taking the people away from their labor? Get back to your work!” “ – Exodus 5:4. What was his motivation for doing this? The people wanted a few days off to deal with something non-work related, and Pharaoh didn’t see any value in it for himself. He knew he needed to do something to keep his slaves under his thumb, so he decided to work them so hard they could think of nothing else and had no strength or time to do anything personally meaningful. These days it isn’t so blatant, but a book by the title More Bricks Less Straw: Ancient Keys to Unlocking Potential and Increasing Productivity within Your Organization by David Farrington rather sums it up. From the description of the book it sounds as if this is considered a successful approach to management, something to be emulated. “In today’s cutthroat business environment, leaders are expected to do more with less. Bottom lines are on the increase; available resources on the decrease.” “…And really, it’s nothing new. In ancient Egypt, the Israelite slaves were forced to make more bricks with less straw. With fewer and fewer resources, the Israelites had to find ways to meet higher and higher demands. David Farrington transports this and other familiar Bible stories into the modern workplace, demonstrating time tested solutions…” (emphasis mine). Really? I find it offensive that expecting more productivity with fewer resources is considered a model for success. It is destroying families and communities. Public school has become a factory for producing interchangeable cogs rather than a place for kids to develop critical thinking skills or to learn to become innovators. Parents no longer have the necessary one on one time with their kids to teach them morals and family values. The stress of being overworked and having no time to do anything is wreaking havoc on our society and the consequences are obvious in our imploding economy and run-away inflation and taxes. Oh sure, people say inflation is not that bad, but these same people are getting their information from a 30 second sound bite called a news story. If they actually ran the numbers for themselves they would come to a far different conclusion. But who in the world has time to do that? And so we’ve come full circle. Last year I planted my first veggies in an attempt to start gardening. It was not a total failure, but it was not even close to a success. I’m trying again this year. Between work, the house, the yard, parenting, and now the garden, I am overwhelmed. The need for high quality food in my family’s diet is paramount, but I can’t do it on my own. It takes a village, and I don’t even have a partner in this endeavor. I think the only hope an individual has of succeeding in becoming more resilient in these times is to have far more money/income than I do, far more free time or flexibility job-wise, or maybe even both. I am coming to fear that in this battle of man vs. suburb, – as far as the common man is concerned – suburb is winning. Here is an update on what I have been attempting to accomplish toward my resilience. It is important to note the timeline because it seems like so many people are able to just commit a small fortune and an entire week of time to getting their garden (or whatever) established, but let’s face it, there are a lot of people stuck in the rat race that only have snippets of time and limited funds to try and pursue their freedom/independence with. Yesterday I overheard the staffing agent for our location mention that he enjoys hunting, so I asked him about it to open up a dialogue. Always be looking to expand your social network with like-minded people, right? He said the next time he and some friends get together to go hog hunting he’d let me know. If he does I fully intend to take him up on it. This will get me the opportunity to meet other people that know how to hunt, I can get pointers from people skilled at it, and I’ll be able (hopefully) to stock my freezer. He said you can get a hog butchered for about $65, which is a good deal for 100 pounds of free range meat. – Planted rosemary bush in front of house. I hope to replace useless decorative bushes with useful ones. I don’t know if the rosemary will get enough sun or not which is why I only planted one. If it does well then I’ll plant at least two more to start a hedge. OF course one of the ways of cutting my monthly expenses that I’ve been most successful at (which has enabled me to spend as much as I have on the garden) is in the grocery department. As a general rule I try to only buy meat that is less than $2/pound. This isn’t always easy, and it means we rarely get to eat beef. I do spend more on fish because if I find fish for that price, I’m thinking I probably don’t want to eat it. Also when it comes to chicken it must be less than $1/pound. It helps that I don’t buy boneless, skinless breasts which happens to be my least favorite part of the bird. Since adding more fat to my diet and all but eliminating bread and pasta, my cholesterol numbers have improved dramatically. – Bought another blueberry bush (Tifblue?) since two are required for pollination – $10. Neither is in the ground yet, still trying to determine the best place to plant for proper sun exposure and I need to acidify the soil for them. I’ll probably buy (aaaargh: buy buy buy!!!!) some azalea potting soil mix to plant them in and water them with water/apple cider vinegar solution. – I have moved the basil plant to a much sunnier location because the first basil plant only gets about 2.5-3 hours of sun each day. I’ll see which does better. – Bought a 16 pound brisket for 1.97/pound – finally, beef!! – Bought 3 sweet potatoes from the grocery store that I am going to plant and see if they grow. I have done this with regular potatoes, and in fact are what is doing best in my garden currently. Not only can you eat the tuber part of the sweet potato which is better for you than regular potatoes, but you can eat the greens as well. At least this is what I’ve heard. Don’t know what they taste like but they can’t taste worse than dandelion leaves or collard greens. I have to keep this in the front of my mind when I think about just how much money I have spent starting my garden. It is something that must be done for all the reasons I’ve listed in the past: if you can’t feed yourself you aren’t truly free; the quality of the food we purchase and consume is terrible; there is more to growing your own food than just sticking it in the ground, this is a skill that must be developed and there is a definite learning curve. I find myself broke again and halfway wishing I hadn’t spent the money. I don’t have to garden right now; perhaps I could have used the money more productively. The garden isn’t going to make me money, not too sure it’s going to save me money – especially this first year. I am trying to adjust to being a single dad and make it on my income without overtime. Make no mistake, I thought I could learn to garden on the cheap, a little at a time, but that would just make the learning curve exponentially long. I took today off from work because it is my youngest’s birthday and I wanted to see her off to school and be here when she got home, she really likes it when I am. It’s also a good dad thing, let’s her know that she matters and that she is important to me; that I would sacrifice for her. This also gives me an opportunity to clean up the house before the ex comes over and it allows me to get a little more life done as well. Priced materials for the patio cover I want to make. Looks like I’ll need to spend around $200. That’s just to get it covered, that doesn’t include the cost of building the deck on top of the cover. The material I priced will be for supporting the second story deck, it’s just that instead of building the floor of the deck I’ll probably just add some of that sun screen material over the frame until I am ready to buy the remaining lumber and hardware for the floor and railing of the deck. This is contributes to resilience because it will reduce my cooling bill this summer. I know this for a fact. – Bought some organic azalea soil mix to plant my blueberries in – $12.99. – Priced materials for the patio cover I want to make. I have a 30gal trash can in my garage that I have been using to keep random things like scooters, tarps, bicycle pumps etc. in. I originally found it in that alley waiting for trash pick up because it was filled with rot ting yard waste. Someone had filled it with leaves and grass, then left it through a couple of rains and sun, and it stunk. I took some garbage bags and dumped the rotting debris into it, took the can home and cleaned it. Well today I found new homes for the stuff it was holding it took it out back to use as a water catchment. The plan is to set it up on two cinder blocks for some elevation right under my drain spout. 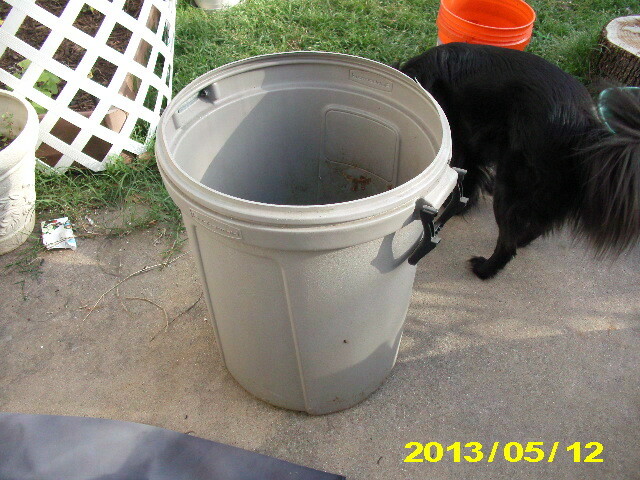 I will put a hole near the bottom and run a hose into it so I can use rain water for watering. I guess I’ll have to use aquarium glue instead of caulk to avoid any chemicals in the water. I have some screening that I will put over the top of the trash can that is long enough to hang over the sides so I can just wrap some cordage around the can to hold the screen in place. I believe the mesh is fine enough to keep mosquitoes out. There was a time when the average person was fairly resilient and resourceful. Men and women had a fair amount of knowledge about how to deal with unforeseen circumstances that they may encounter. They knew “stuff happens” and weren’t completely helpless when it did. They didn’t have the luxury of a cell phone, a credit card, and a convenience store on every corner. They also tried very hard not to spend unnecessarily, and the best way to accomplish that was to be able to fix things; reuse repurpose recycle. Knowledge alone was not enough, so they also carried a few basic accoutrements to aid in said endeavor. Your great grandmother didn’t view her purse a fashion statement designed to carry some overpriced designer sunglasses. There was also the way they looked at life – the way they thought and approached life. There was no one to bail them out of their bad choices; they were accountable for the outcomes of their decisions. Being resilient means a return to accountability. It means if you don’t work, you don’t eat. If you squander what you have, you will then go without. It means the perpetual adolescence is over, it is time to grow up and act like an adult. Our parents and grandparents provided for their families, they didn’t rely on the government or their own parents to provide for their needs. They took action. They knew that sitting around watching other people live their own lives was not living. They also knew that they were entitled to little beyond their right to self-determination. An Update – I should make note that I no longer have a spouse to contend with when making decisions regarding my prepping. She got tired of struggling so she moved out (like the struggle going on is somehow my fault). I am, however, still saddled with serious money and time constraints. – Last Wednesday I had my saliva gland removed – a surgery I have been putting off for years. Start getting all medical procedures handled before it becomes too cost prohibitive, before insurance starts covering even less and less than they do now, or while you still have insurance at all. The future of health care is uncertain, insurance is not getting any better, and neither is getting any cheaper. – The second week of March (3/10/13?) I sent off my completed application for a Virginia non-resident Concealed Carry Permit. It took me several weeks to get it completed. One day I took the training course and requested the application (it has to come through the mail, but you can make the request via email). I had to take a day off work to get my fingerprints done. Once I had saved up all the fees I would need for processing I got my money order and passport photos. You can get passport photos at CVS, btw, so I got my money order and passport photos at the same time. – Yesterday I ordered 4 more Sanyo Eneloop rechargeable batteries. As I replace dead batteries with rechargeable I find that I have more things utilizing batteries than I realized. Recharging is far less expensive, and far more convenient, than buying new batteries. I also don’t have to worry about running out or there being a run on the stores during a power outage. I can run the charger off of my inverter. – Saturday my 9 year old and I started our lacto-fermented pickles. This is a good prepping skill for gardeners, and lacto-fermented food is very good for you. – The last Saturday of March I bought a tomato plant, peppermint plant, and basil plant. I put the mint and basil in the ground where they won’t get that much of the Texas sun. I’m experimenting right now because I don’t know what the best places in my yard are for the various things I want to grow. In a couple of weeks I will buy another tomato, basil, and mint plant and then I will plant them in a different location. I want the tomato plants to go into the ground at the same time so late planting can be ruled out as a cause of failure.